In the December, 2003 issue of the Biro Technical Bulletin, the need for the comprehensive computer developed HDTV reception study was discussed. In Part 2 of the HDTV tutorial, appearing in the January, 2004 issue of the Bulletins, the subject was the identification of HDTV interference. This time objectives and requirements of HDTV reception on-site verification testing will be our topics. A computer aided HDTV reception study provides a wealth of information. But even the most meticulously prepared computer runs and scientifically developed signal direction sheets have certain shortcomings, which should not be overlooked. First, the computer calculated DTV signal levels are based on flat terrain, average conductivity, omnidirectional transmit antenna radiation patterns and fair weather conditions. How many sites qualify for all these assumptions? Second, the computer cannot be programmed for local interference, such as electrical (AC) interference generated by high voltage power lines, or RF interference, caused by mobile radios, harmonics of broadcast stations, vehicular traffic, etc. Third, nor can the computer predict the presence or absence of reflections (ghosting), a real HDTV picture quality killer. Only a professionally conducted on-site HDTV reception verification testing will deliver factual test results, assisting the survey engineer in making the proper recommendations, approving or rejecting the proposed HDTV reception site. A rotor-mounted high quality VHF/UHF search antenna. If an existing antenna site is tested, install the rotor-mounted antenna on the top of the tower. When surveying a new location, mount the rotor-mounted search antenna on a telescopic mast. A top quality spectrum analyzer.Large screen TV monitor and HDTV tuner. Camera with a close-up lens. Computer run and signal direction sheets, prepared in advance. Start the process by pinpointing the antenna to the North, then rotate it clockwise. Point the antenna toward the first group of stations as indicated by the Signal Direction Sheet. Record the signal levels, observe picture quality. Move to the next group of stations as indicated by the Signal Direction Sheet. This methodical search saves lot of time , reducing the chance of missed stations. 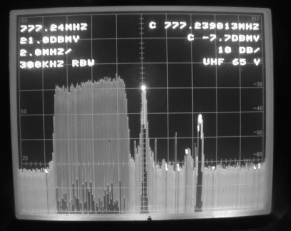 To obtain maximum amplitude readings on the 5 MHz wide DTV power spectrum is not always an easy process. Use the video carrier of the analog affiliate for orientation purposes. 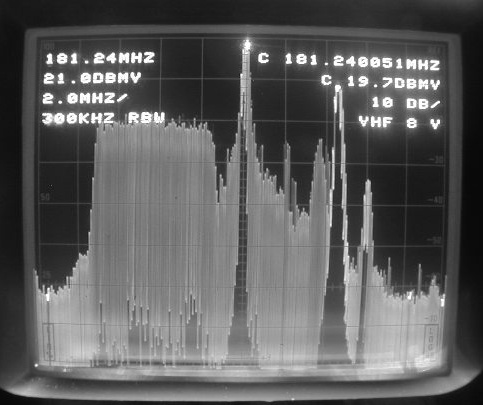 Analog stations operate their DTV affiliate 95% of the time from the same antenna tower or TV antenna farms, displaying the analog and DTV spectrums displayed side-by-side, as shown on the photographs below. Operating the analyzer in the linear vertical deflection mode (maximum sensitivity), peak the video carrier amplitude. The antenna will deliver the highest analog and digital signal levels. This method is specially convenient when the flatness of the 5 MHz power spectrum is less than perfect, as shown below, and the slant of the top changes with the antenna rotation. 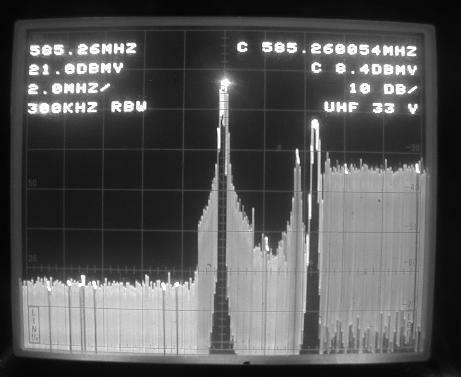 When the analog and DTV spectrums appear side-by-side on the screen of the analyzer, and the transmitters are co-located, confirm that the 5 MHz wide power spectrum amplitude stays 16 to 20 dB below the amplitude of the analog video carrier. After peaking the antenna, connect the downlead to the input of the HDTV tuner and observe HDTV picture quality on the TV monitor. Next, insert a 10 dB pad into the line and make sure that the picture quality remained unchanged. A 10 dB reduction represents worst case conditions. It is more than the anticipated signal loss due to inclement weather conditions, airplane traffic, corrosion of antenna elements, etc. It is a reasonable assumption that the HDTV pictures will not suffer a catastrophic failure. Interference identification is another paramount objective of the on-site HDTV reception survey. Connect the antenna downlead to a two-way splitter, observing the spectrums on the screen of the analyzer, as well as the picture quality on the monitor TV set. Assuming that adjacent and co-channel interference signal direction sheets were prepared in advance for the critical (distant) DTV stations, select one of the sheets, line-up the antenna according to the computer calculated direction of the desired stations and confirm the presence or absence of interference on the screen of the analyzer. Take a photograph from the screen of the analyzer, recording the adjacent channel interference level and note any artifacts on the TV monitor’s screen. The photograph on the left shows a situation when the desired DTV channel was affected by strong adjacent channel digital interference. The picture on the right side records another frequently encountered interference problem. 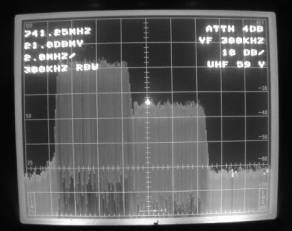 This time a grandfathered analog channel suffered from the adjacent Channel 64 power spectrum, resulting in very noisy pictures. The ideal verification survey should take a full week, with hourly recording of the desired channels at least 12 hours a day. Of course this is an impractical arrangement. The most desirable time for conducting the on-site HDTV reception survey is at mid-day, and particularly 1:00 to 3:00 PM, when the signal path from the distant UHF station may be broken by heat turbulence and ascending warm air layers. This does not mean that surveys conducted on a foggy or rainy day are of no value, but early afternoon hours represent the most favorable testing time under any conditions. Almost all UHF distant stations exhibit characteristic fades between 1:00 and 5:00 PM, with maximum depth of fade occurring around 3:00 PM. A survey without a professionally prepared Testing Report has no value for the CATV system. Signal level and interference conditions should be recorded by the spectrum analyzer, the test results documented via top quality photographs from the screen of the analyzer, accompanied by a deep analysis of the test results. When characterizing the quality of the received pictures avoid such statements as “poor pictures”. Poor is a very vague term. Was the picture found poor because of low signal levels, fading, or excessive interference? No Testing Report is acceptable without presenting an antenna bill of materials and straight forward tower height and antenna-array recommendations. While the on-site HDTV tests and measurements procedure may appear simple and obvious, attention to the technical and non-technical details, such as availability of AC power, access road, notification of the local police or sheriff’s department, can avoid costly cost overruns and delays. Perhaps the best way to guard against pitfalls is to hire professional assistance with proven experience, willing to sign his/her name on the dotted line.